Have you seen my latest crush (she's responsible for #3)? I love birds!!! And those blue birds are so cute!! Loving this shade of blue. Makes me want to head for the beach! Absolutely GORgeous! 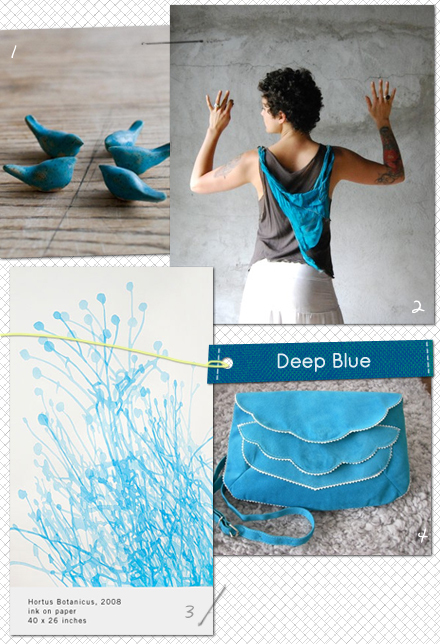 I love, love that color blue, those birds, that top, that PRINT (sigh) and that bag! those little blue birds are adorable! I just discovered your blog thru twitter via Creature Comforts, I love it! I'll be coming back!! Oh, and I commented here because this picture you made got my attention, the color, the layout, so cute!